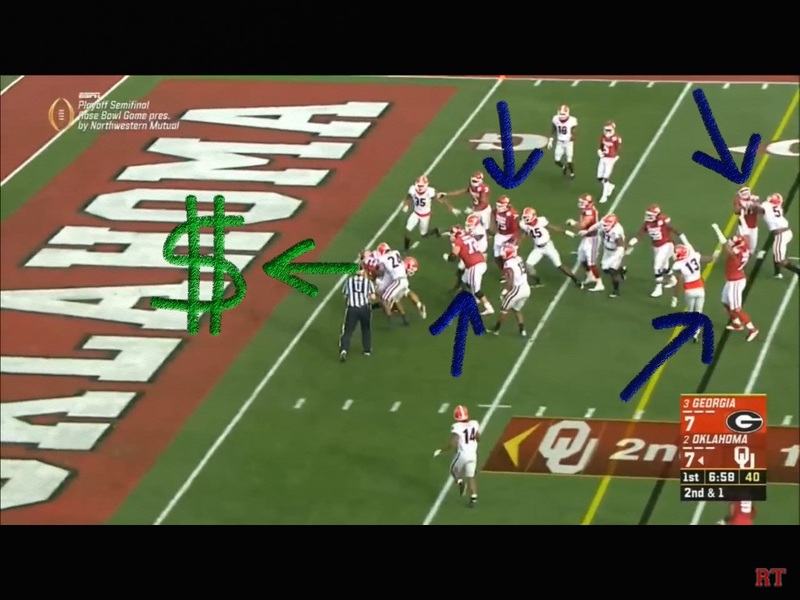 When the Sooners got the ball back, Riley had ’em big time spooked. 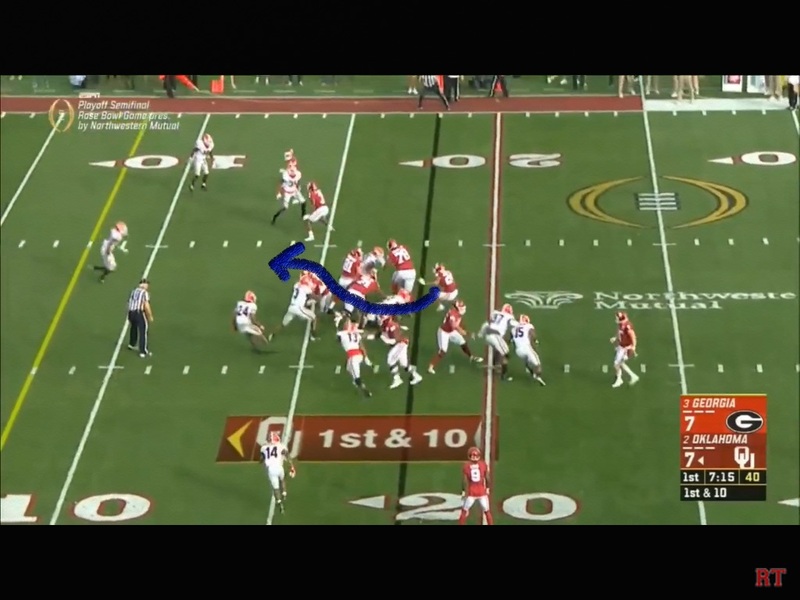 With trips right, Smart had shaded both of his linebackers over to the right, and in essence had 5 guys over to cover 3 receivers. 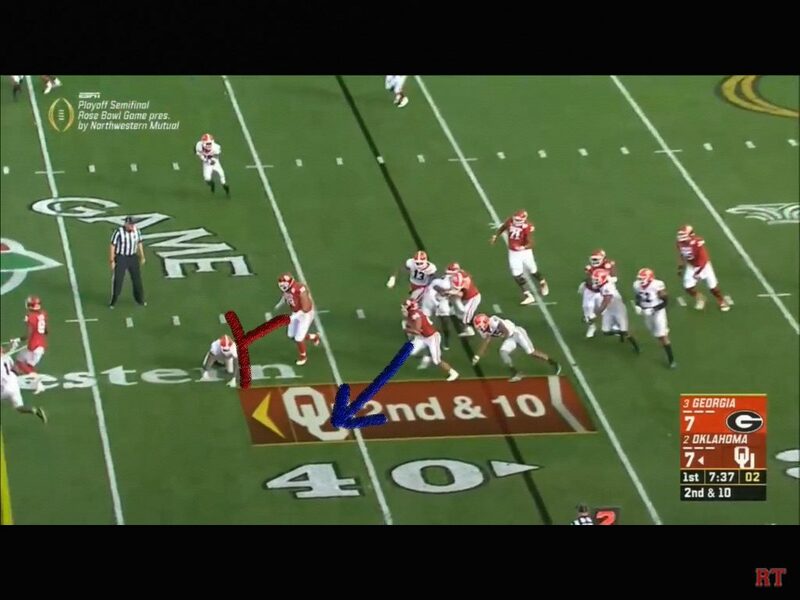 Look at the big area vacated to the left of the linebacker. With Hollywood coming on the Jet Sweep motion, Baker raises up and throws it out to em. The give is clearly there as well, with Samia comboing up to the linebacker. In behind Bobby Evans was a nice lane had Baker given it. But this is easy money, and a pitch and catch out for 9. What Riley was doing early was basic and easy to execute. 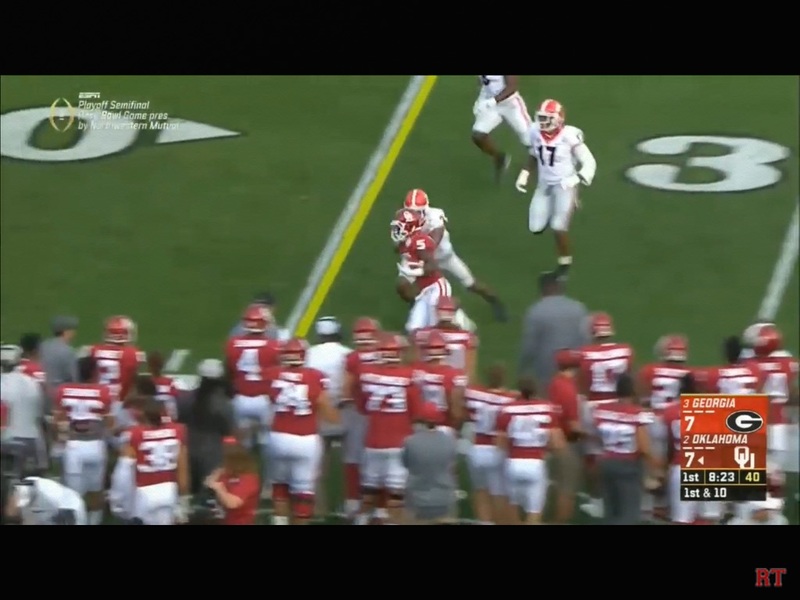 Georgia never had an answer for these swing passes off of the jet sweeps to Brown. On 2nd and short, look at all of the space that Andrews is getting from the DB. 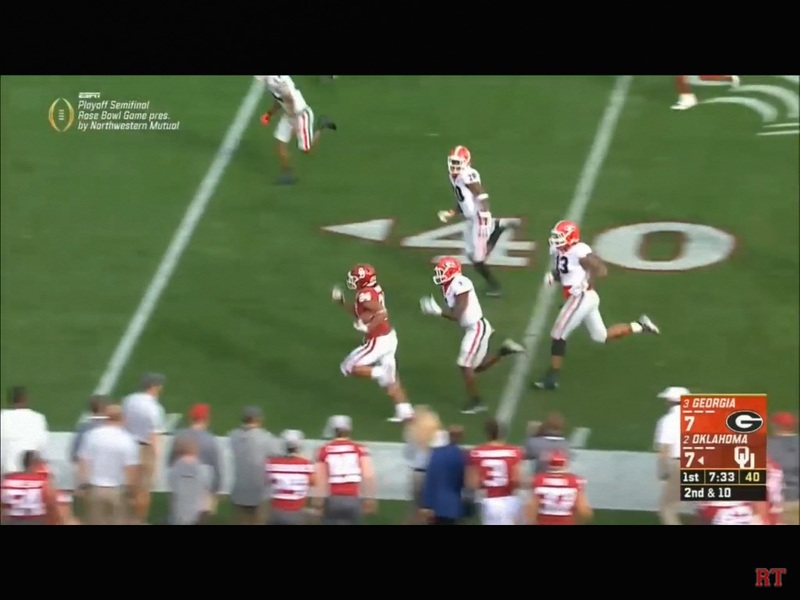 Georgia throws 7 in the box this time against OU’s 6 blockers. 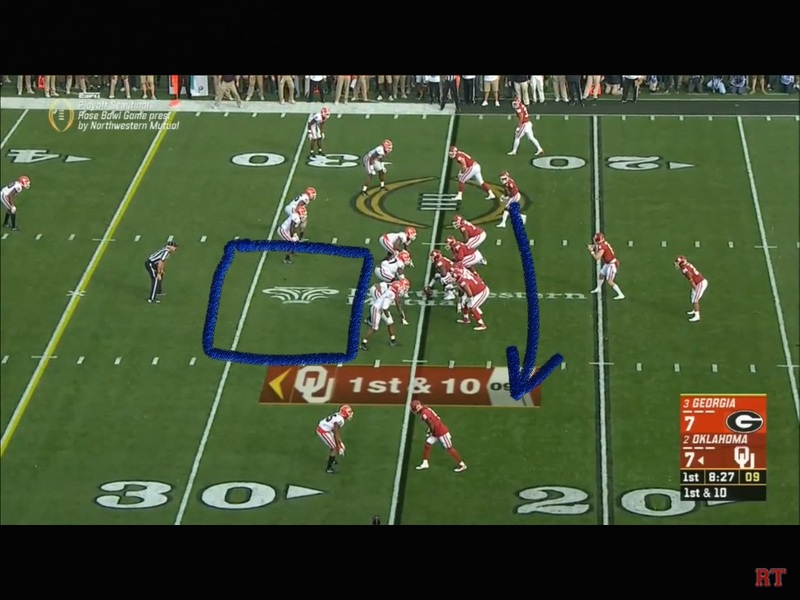 With QB run game OU has a plus one. Samia’s lucky he didn’t get whistled for a hold here, and had Rodney went outside of Andrews, I think he’s still running. One of Rodney’s strengths, and weaknesses, is that he sticks to the play. 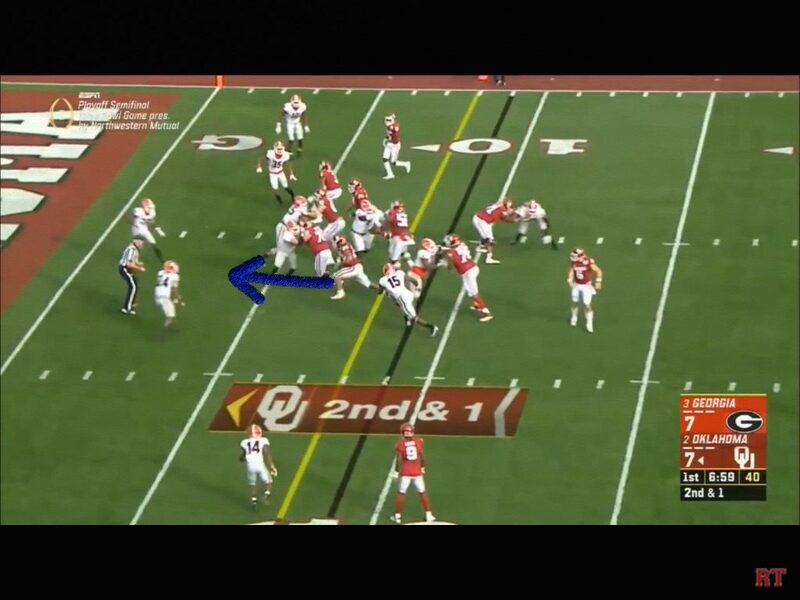 He showed nice patience, and this was the 1st uncalled facemask on an OU runner in the game. The red arrow path behind Andrews is there as well. This was really nice push against a very stout defense. Samia didn’t give up, didn’t get called and got em on the ground while Rodney got the 1st. It’s a 5 man box again with 4 defenders covering 3 to the right. 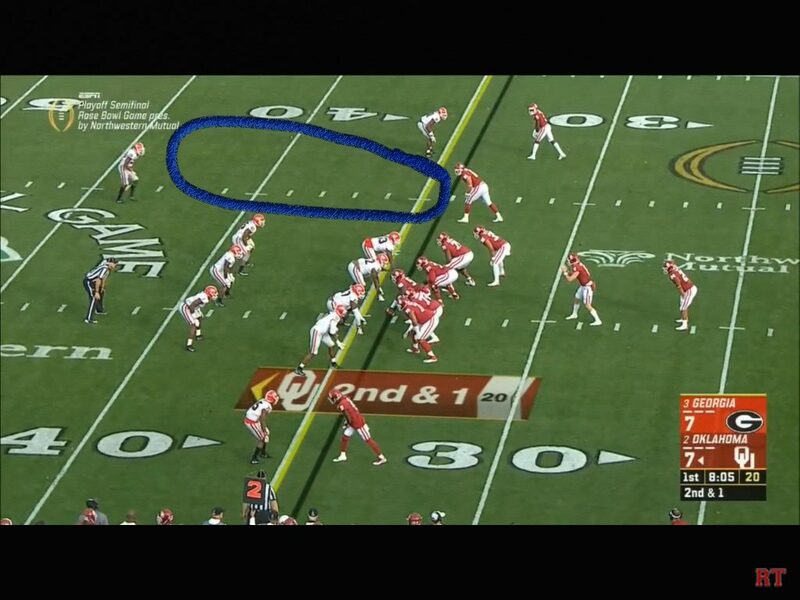 Early, Georgia was daring Oklahoma to run it, and that 1st drive had em deathly afraid of the pass. 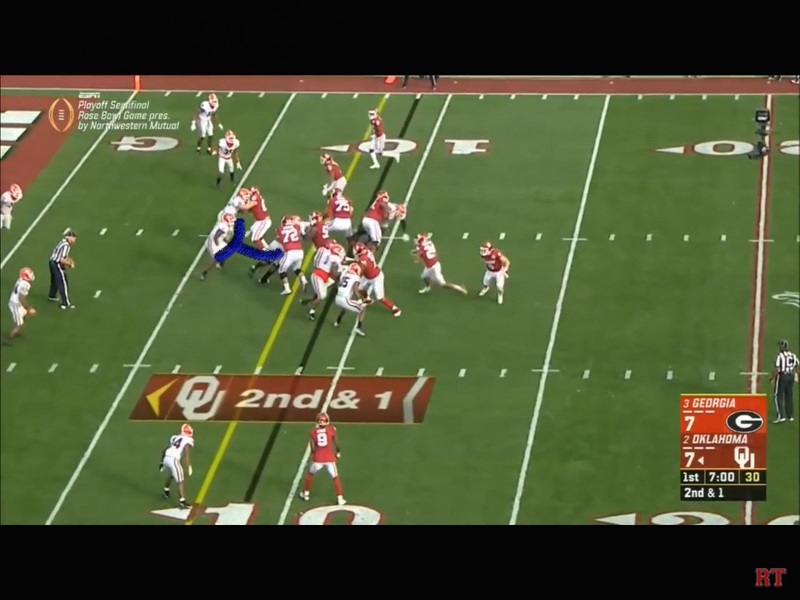 This play had Bedenbaugh’s fingerprints all over it, as it’s a textbook combo block up to the Butkus award winner by Orlando Brown. 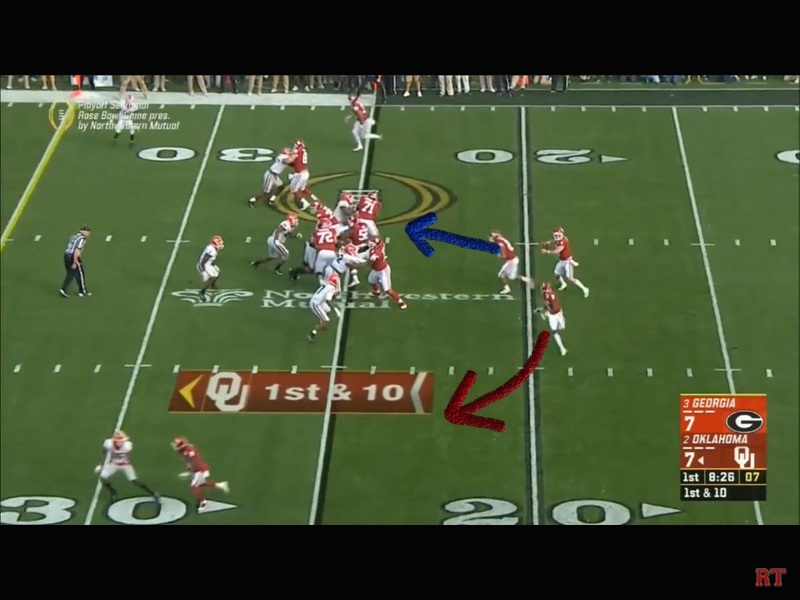 Wren is pulling around on a trap draw, and it’s a nice handoff action by Baker to make em think it was a pass. Everyone defensively thinks he’s gonna throw it out to Andrews on the right. Orlando worked up to Roquan Smith and roll-quanned em. Rodney’s enjoyin’ the view of his big homie smashin’ folks, and it’s off to the races time. 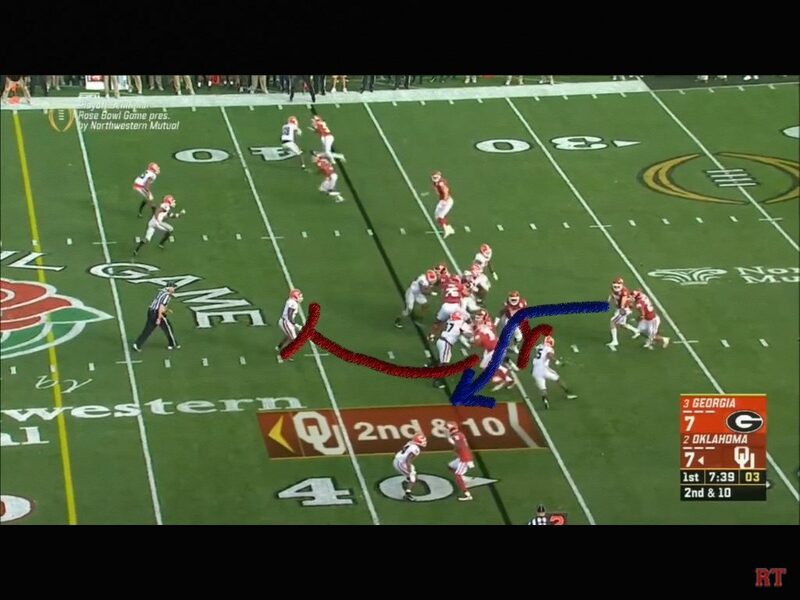 Rodney showed great speed here and got all the way down to the 20 before 3 guys had to bring em down. While the 1st drive was all pass, this one was all run, and it was all beautiful. 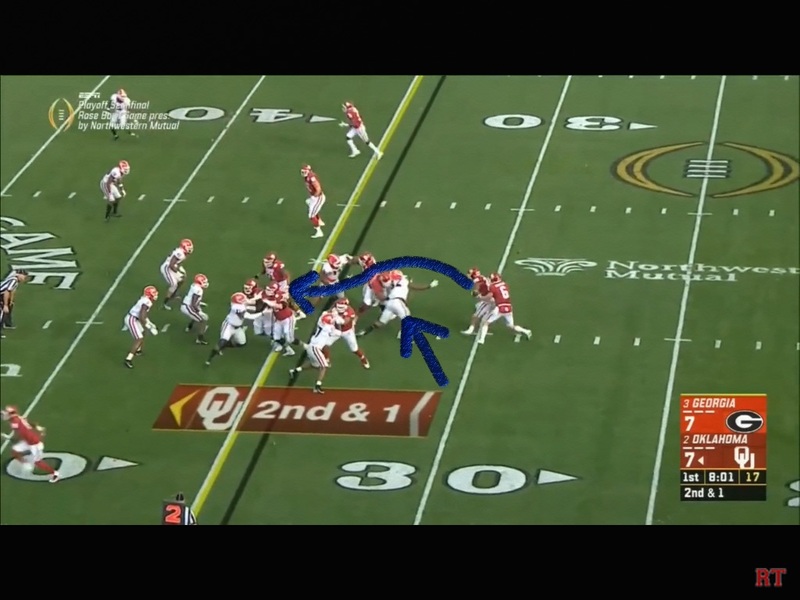 Rodney took the handoff a play later, jumped over the DT on the ground and got up in behind Evans. The thing that excited me here was that it was a 7 man box with the safety flying up. 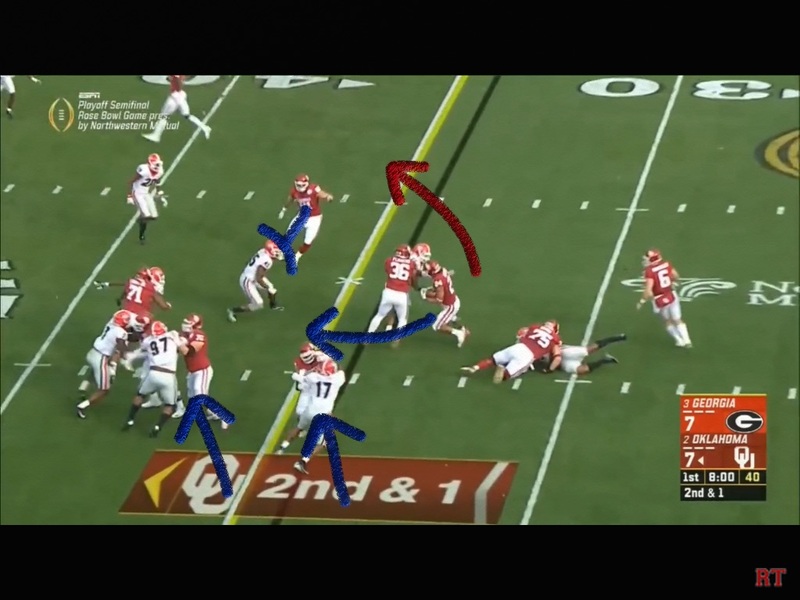 Powers is 7 yards downfield, defender bodies strewn everywhere. The O line was straight mashin on this drive, and if I’m Riley, I wouldn’t have thrown another pass until they stopped it. This is a textbook combo block by powers and Wren. You’re taught as the inside guy to treat this as a one on one block. So really the nose/A is Wren’s block. Powers comes off the ball in unison with Wren, they “weld” their hips together to make sure the defender doesn’t split the double. Then when Powers “feels” that Wren is o.k. he has to come off and secure that middle linebacker. 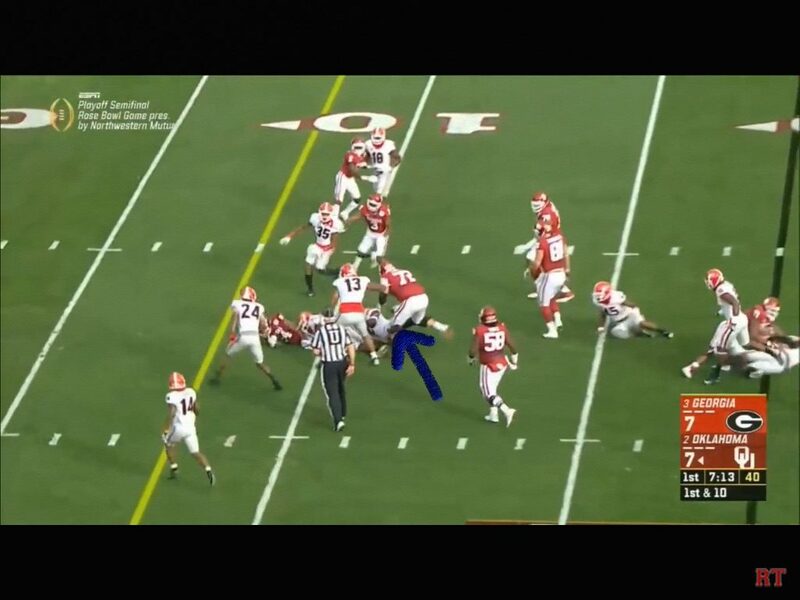 Now if the linebacker comes up hard on the snap, Powers has to come off early. That’s why Wren has to treat it as a one on one block, and Powers has to play with his eyes to be conscious of the middle backer. A split second later, it’s really opened up. We can see Wren’s guy moved over and Powers locked up on the backer. You’ve heard me time again talking about getting your running backs one on one with your safeties. Well it’s one on two, but Rodney’s pissed and it’s finna get ugly for those two Georgia defenders next to the official. 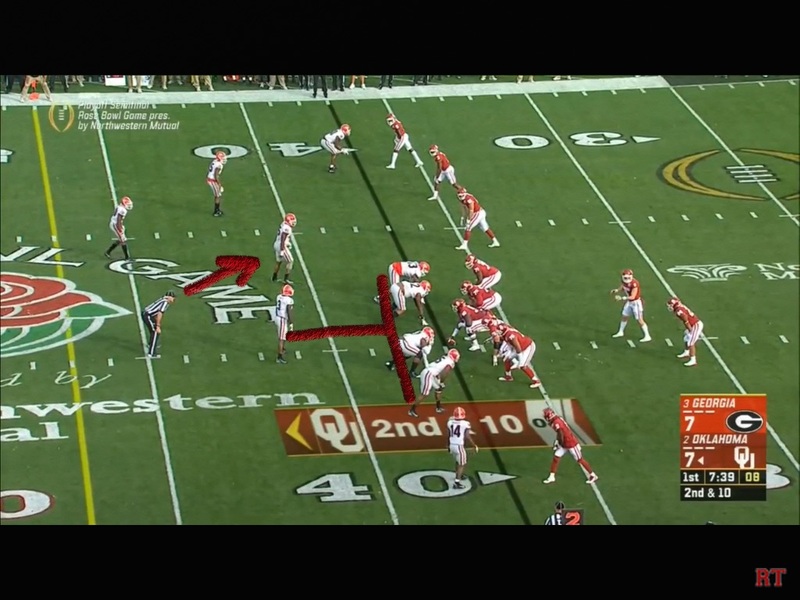 After this run, there was no way…(channelling my inner Buford T. Justice here)…no way you could tell me that Oklahoma was going to lose this game. This was the most dominant drive from a rushing standpoint against a great defense on a huge stage that I’ve seen in a long time.